Canada has “no history of colonialism.” So said Stephen Harper in 2009. 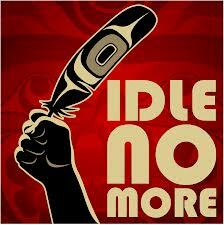 Today the Idle No More movement is shouting down this lie through actions both creative and courageous. In its place, it is telling Canadians at large what some of us have always known: that the country we live in was founded as – and continues to be – a colonial-settler state. Colonialism involves one society seeking to conquer another and then rule over it. European countries worked to conquer the Americas, Africa and most of Asia between the end of the 1400s and the 1800s. In the beginning, the goal was usually to gain access to resources – including gold, silver, furs and fish – that could give a boost to the feudal societies that existed in most of Europe at that time. The amazing energy, organization and assertions of Indigenous sovereignty that have recently taken place within Canada have shone a light on the truth of how the country was founded and how it is still run. Every week there are new and more actions – flash mob round dances, railway blockades, consumer boycotts, hunger strikes – that are working to force non-Indigenous people to see the reality of the country they live in and the ways that it continues to disrespect and abuse the original keepers of the land and exploit the land itself. Bright lights are often described as harsh, but illuminating truth is an act of respect. Since its founding 146 years ago, the Canadian state has walked arrogantly, cruelly and carelessly forward, refusing to look back, and working to make non-Indigenous people believe they shouldn’t either. The respect – even love – for the land and all of our relationships with it, and with each other, that has been expressed in recent weeks has challenged non-Indigenous people to take another look. Monique Woroniak is a librarian who works, writes and does Indigenous solidarity work in Winnipeg. David Camfield is one of the editors of New Socialist Webzine where this article first appeared. Both authors acknowledge that they reside on Treaty One territory and the traditional lands of the Red River Métis. Todd Gordon, Imperialist Canada , Chapter 2.